She got married just a hair less than two-months ago. 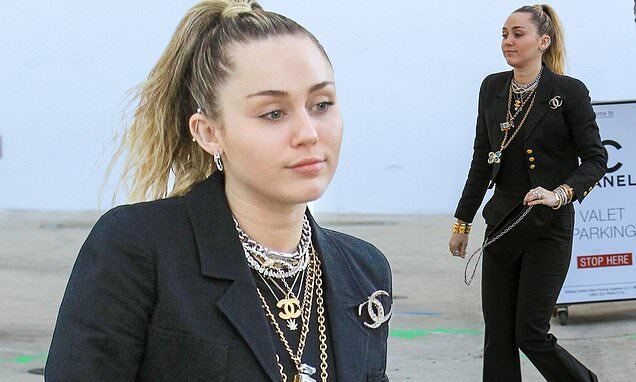 But Miley Cyrus, 26, was on her own on Friday as she stepped wearing all black while shopping at the Chanel boutique in Los Angeles. Her husband Liam Hemsworth, 29, meanwhile, was spotted in the evening heading into the WME Pre-Oscar Party. The Wrecking Ball singer looked chic in a black Chanel suit as she headed through a parking lot. Accessories were the name of the game as Miley donned a variety of necklaces, silver rings, and a number of rings - all from the French fashion house. Her blonde tresses were pilled back into an easy ponytail and she painted her lips a soft pink. Liam kept things casual as he headed into the pre-award show even dress in a t-shirt and black pants.